One of my grovemates expressed that she felt she had nothing really to release this Samhain. She has had a great year, riding on smooth currents, finding purpose, love and ecstasy. Sometime we manage to find a current in life that doesn’t feel like baggage. These currents are precious as they can fuel us through the difficult times. So we feel we have nothing really to let go of. But still there is work to do. As my musical hero, Bruce Cockburn, wrote in his song Feet Fall on the Road, “Though chains be of gold, they are chains all the same”. A lot of wisdom in that phrase. Even though we may not be carrying any emotional baggage, no intellectual burden, no new health issues that restrict us, there is no way getting around the fact that the past year is behind us. Those days and nights have been spent and we will never get them back, no matter how fond our memories. The past year of our life, is done. And this is always the case as the moments pass by. In Druidry, we are in a constant process of reaching for wakefulness. So even though the year may have been blissful, it is gone, now an illusion living only in memory. So here at Samhain, as with all of our spiritual activities, we reach for wakefulness, acknowledging the year behind us, finding our feet under us again, here now, in this moment, in this place. And fully present, we check in with our loved ones, our tribe, our coven, our grove, and our own soul. Honoring the tides of Nature and the Spirits of Place, we ready ourselves for the long darkness ahead. And through these sacred rites, we find inspiration. So on this Samhain, in honor of the inspiration I’ve received, I offer you this poem. 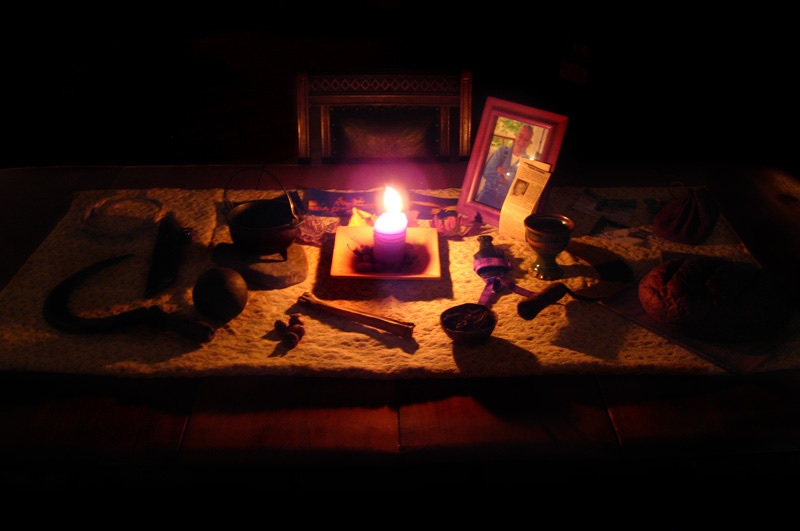 Every year we experience the Samhain tide – the time between Samhain and Yule. It is a time where the cycle of growth has ended and the new cycle of the year has yet to begin. Natural death in Nature comes with the first killing frost. Our harvest is in or it is lost. The temperature grows colder as the winds come down from the North. The days continue to shorten, falling ever more into darkness until Yule when the light begins to return and the hope of a new growing season can be held. Such is the nature of this season here in my beloved Maine. This time between the end of the growth cycle and the rebirth of the sun at Yule is a time of deep unknowing and chaos. It is time to indulge in dreams, to dive into Ceridwen’s mythological cauldron, dreaming without limits. As the darkness grows, we instinctively go inward, exploring our inner landscape. It is a gift Nature gives us every year. The leaves have fallen off the trees, sloughing off the dead flesh of last years growth. They aren’t needed. Their purpose served, they return to the source of Mother Earth, their creativity coming apart as they become leaf mould. There is a profound lesson in this – that of letting go of the past that no longer applies to our life today. Following the wheel of the year, the Craft offers us an opportunity to look in the mirror and see ourselves in the present, to stop long enough from our toils to take an assessment of our life. As we face the long winter, the harvest in, Samhain is the perfect time to do so. During the Samhain tide, I take the time to review my life and rid myself of everything in my home that isn’t beautiful, useful or valuable. In Maine we will be spending the next six months inside for the most part and I don’t want to spend it surrounded with useless clutter that has no place in my life anymore. Nature has shown us what natural death is, the dead vines in the garden once so vibrant with green now lie brown, dried and crackled, decaying into source that will feed next year’s garden. Our death will come too at some point, our cycle of growth coming to an end. While I don’t know when this will be, I want to be prepared. So at Samhain, I take the time to review the Death and Dying package that I put together with my wife and another pagan friend. In this package I put all my personal information regarding my eventual death. I put in personal contact information, financial contact info, obituary details, burial plot location, my Advanced Directive, funeral wishes and on and on. The idea being that should I pass suddenly, those left behind won’t be scrambling trying find all this information at the worst of times. One part of this package involves an activity which I think is a beautiful gift to those who will survive us. I write farewell letters to those people important in my life. Imagine having a letter left to you from the person you loved most after they passed suddenly. Writing these letters is a deep look inward at what we value most. Perhaps we keep the letters or perhaps we burn them in next Samhain’s fire and write new ones, honoring the ever-changing nature of relationship. The act itself is highly freeing and I can not recommend this mediation enough. It is a powerful act to own one’s death and to prepare for it. The final step is one we make alone. I want to be prepared to take that step when the time comes, and to do so without worry that I’ve left a mess for those I leave behind. This cleaning out, letting go and preparing for Death is extremely freeing. We don’t know what life holds for us in the future but freeing ourselves to face the present as consciously as possible is a powerful step toward approaching the future with courage and enthusiasm. We become unchained and the not knowing becomes an enticement instead of a fear. Samhain offers us a powerful yearly opportunity to reach for more freedom. Although death may be all around us, assessment, acceptance and release can free us like leaves swirling in the wind taking journeys of flight they couldn’t dream possible while attached to the tree. So embrace the darkness. Open your arms to the cycle of death that comes every autumn. And most of all use your freedom to dream in endless potentiality. Time will move potentiality towards possibility and then into opportunity. But now is not the season for deep plans. It is a time to just dive deeper than ever into the cauldron, dreaming your life into being. Free yourself to dive without the chains of the past tied to your soul, holding you in the realm of the known. The unknown path is always the safer one. Tomorrow I head to the local prison to celebrate Samhain with the prisoners who established the Wiccan Group. I always look forward to visiting the prison as I encounter men who really are working to walk the talk of their religious ideals. Part of tomorrow’s celebration will be the sharing of pomegranate juice and fruit, and the retelling of the tale of Persephone and her journey into darkness, into the underworld. Each time I hear an ancient myth, I think about the people who created it. What was it they were trying to express and who were they trying to express it to? What importance did these myths play in the tribe? I bring this up because I see our modern American society in the midst of a crisis of imagination. Where are the myths to help people understand the processes of life changes that we experience today? Our myth in America is that of “Going West”. Well that journey is known now. Hop on a plane and go to that mythological West in a few hours. Drive around in your car out West and you can see it in great detail. But seeing isn’t experiencing. Just seeing, allows us to remain distant and not engage. We also have the “Rugged Individual” or “Pioneer” myth, individually scrapping a living off the land while fighting off the savage Indians. This myth has little place anymore. Land can’t be claimed in places that allow us to live near our tribe. And we all know the “Savage Indians” to be tribes of indigenous human beings who suffered genocide at the hands of our European ancestors. While homesteading may offer a way to walk with this myth, getting the land is nearly impossible without dedicating much of our life to being a cog in the socio-economic system that is Capitalism, American style. The prominent religious myth in this land is that of Christianity. It is the stories of people in the Middle East who wandered in the desert seeking for the promise land. The teachings of their main prophet instructed people to look past the suffering they experience in daily life and reach for eternity in paradise. That is a difficult myth to bring into modern America where we have little to no sense of a tribe. We move as individuals based on finding a job. We spend so little time in a location, we have no sense of being a steward and the land suffers with our passing. The land is view as a resource and money is the reason we wander, uprooting when a better job opportunity comes along. And finding comfort in life after death is a hard sell to a society whose main mode of being is one of immediate gratification through consumerism. So our major myths don’t easily fit into the daily experience of people in 21st Century America. And myth is the way we have been able to act out the rituals that help us find our place within the tribe and to embrace the process of change in life. So today, we as a culture stand without myth and that is a dangerous place to stand. Pagans today look to ancient myths from all over the globe, ones that still hold the power to help us walk the path of life without getting lost. We recognize these aren’t historical stories, “true” stories, but rather they are stories that contain great truths. So when we as pagans revisit, honor, and act out the myths of Persephone, Taliesin, the Oak King a Holly King, or possibly even Christ fasting in the desert, we consciously engage in a world that allows us to embrace change; find our place within the tribe; find that much needed sense of connection; and to walk in a sacred manner. And where there is no myth to relate to the processes of the world, we create new ones (as has always been the case). Myths give us a sense of wonder that is sadly lacking in the world. TV is filled with the supernatural. And I always wonder why we need the “supernatural” when the true natural world is so extraordinary. This speaks of disconnection. We can’t find sufficient time and presence to see the ordinary is utterly extraordinary. Myth offers us a sense of connection. The characters in the myth are part of the story, not just inactive bystanders. The characters play their part and know their place in the world (or discover it along the way). Myth being played out year after year, life after life, offers a sense of continuity that is vital for learning to live well in a place. Myth reminds us of what it is to walk a sacred path. Today’s journeys are known, limited and lacking any sense of adventure: school, work, marriage, and retirement. While each of these may offer learning and discovery, they don’t look very appetizing when stated as a noun: school, work, marriage, retirement. Compare those to journeying to the underworld to break the chains of death – or in a modern myth, journey over the Misty Mountains with a pack, a sword and a magic ring, seeking to destroy the very embodiment of evil. Now that is a purpose filled life! Myth offers us a way to ritually acknowledge the transitions we as humans all experience. Myths contain our rites of passage. This is an essential element of myth. Without rites of passage, we can live in perpetual childhood or be surrounded by people who don’t acknowledge our transition (boys that never become men or helicopter parents that can’t let go). Finally, myth offers us a doorway into the intuitive, reminds us there is a whole other aspect to our being other than the frontal lobe decisions of paying the electric bill and remembering to get the car inspected. Myth nourishes our soul with dreams. And dreams are vital. They give us the ability to process the endless amounts of input our mind receives each day. While the conscious mind can process only a few thousand bits of information each second, we take in millions. And we have to process and integrate that information for our own wellbeing. So here we are heading to Samhain where the growth cycle of the year has ended and the days still continue to get shorter and colder. A new cycle hasn’t started with the return of the sun at Yule. We drift in a place of chaos. So I encourage you all to dive into Ceridwen’s cauldron and just dream. And don’t dream small. Dream without limitation. Find a new myth or an old myth, but none-the-less find a myth and celebrate your life journey.